I’ve decided that I need a catchphrase. OK, I don’t need a catchphrase. But I want one. Just a word or three that I’ll utter every so often, and people will come to associate with Mark Petruska. They don’t have to break out into spontaneous applause (though who am I to stop them if they do?) or start laughing – I simply want the recognition that comes with a well-chosen phrase that can be delivered under a variety of circumstances. My own personal tagline, if you will. Call it a marketing ploy. Or a vanity project, if you must. I’ve got a book to sell, people! And an image to go along with it. Don’t hate the player…hate the game. Catchphrases have been around for decades. Bugs Bunny has been uttering “Eh, what’s up, doc?” since the Golden Age of Television. That one’s great – it’s the quintessential all-purpose greeting. Conversely, The Terminator’s “I’ll be back” is the perfect exit. Homer Simpson’s “D’oh!” hits the spot whenever something goes wrong, and Fred Flintstone’s “Yabba Dabba Doo!” is an excellent expression for those happier occasions. 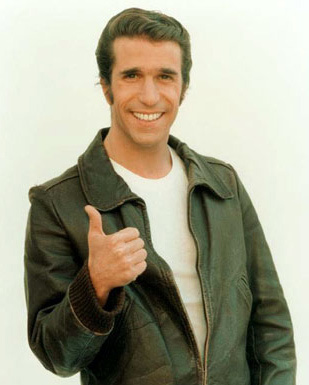 Then there’s The Fonz: “Ayyy” could be used to convey a variety of emotions. One option is to have another person deliver the catchphrase for you. Ed McMahon’s “Heeere’s Johnny!” is a prime example; Mr. Carson then stepped out from behind the curtains, and the crowd was all warmed up by the time he took a few imaginary golf swings at invisible balls. 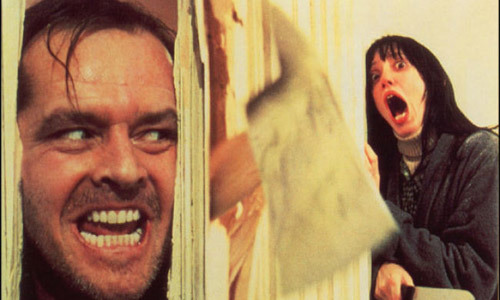 (This same phrase was also used to great effect by Jack Torrance in The Shining, only he was busting down a bathroom door with a hatchet to kill his wife instead of delivering comedic monologues. This just goes to show how versatile a good catchphrase can be). There are a million good ones out there. “What you talkin’ bout, Willis?” “Book him, Dano.” “Come on down!” “The plane, the plane.” “Did I do that?” “I get no respect.” “Cowabunga!” “How you doin’?” “I love it when a plan comes together.” “Hi, I’m Larry. This is my brother Daryl. This is my other brother, Daryl.” “I know you are, but what am I?” “Up your nose with a rubber hose.” Surely, I can come up with a winner! You guys. My dear readers. Why not? One of my blogging friends is handing over the entire task of planning her wedding to her readers. Is she crazy? Nope…just Southern. I actually think it’s a great idea, though! So, will you help me out here? What should my catchphrase be? When, and how often, should I use it? While we’re at it, what should I have for dinner on Tuesday? Thank you for putting on your thinking caps and helping me out with this! I’ll give the winner a featured spot in my blog – one whole paragraph (!!) to write about whatever his or her heart desires. You can promote your own blog or writing project or photography website or artwork or talk about politics or share a picture of your dog in a fuzzy pink sweater or try to convert us all to vegetarianism. The possibilities are endless! I can feel the excitement…can you? Thanks, but that one is taken. “It was like that when I got here.” Homer Simpson and every president since Washington. LMAO! Touche. (Though I’d like to think Honest Abe was above that sort of nonsense). How many suggestions are we allowed to give? I tend to agree here. I’d edit out the word ‘but’. It’s truly a catch phrase that you could use in just about any situation. 1. The Only One Normal Here. 2. I’ll send you a link. Mine wrote itself just by repition for now, it’s: Hope this post finds you lucky and in love. And, there’s no limit! If you think of something even better later, feel free to come back and post it! For dinner??? I’ve been hearing that eggs…you know those $6.00 ones are tasty! As for your catch phrase, that’s easy, you should just keep repeating “buy my book fool” ….. Make sure you say it with a smile on your face, but with a slight hint of seriousness of course! 🙂 Good luck! LOL. I have no more $6.00 eggs left – guess another trip to the farmer’s market is in order! As for “buy my book fool” – I like it. It’s direct and to the point. If I think of something better I’ll come back! Hope you had a great weekend, bud! You have the mother of all catchphrases, Ron. And I happen to think it’s faaaaaaabulous! “Gettin’ my Griswold on” definitely works in some situations better than others. You can come here for dinner on Tuesday. Sounds good! What should I have on Wednesday, then?? Fun post, Mark! I don’t think I can top the catchphrases that have already been offered–too early in the morning for me. I’ll come back if I think of something once I’m semi-consious–or vertical at the very least. I understand, Kathy. I’d hate for you to come up with a half-assed catchphrase simply because you were horizontal. No me, not you, me…as in I have not a clue…but you can use it if you want. For dinner…hmmm…egg white, grape tomatoes, grated cheese and spinach omelets with some turkey bacon and fresh fruit! Might as well eat ‘good for you’ stuff once-in-a-while! “I’m tapped” actually isn’t bad! And look at you, spouting off a super-healthy (and tasty-sounding) dinner idea. I like it! But it ain’t bacon unless it’s PORK. That’s a hard and fast rule I’m sticking by! No clue, but I love all the responses so far. “No clue” could actually work. Oh, Mark. Thanks for the shout out! I think I sun burned my brain regions, but if I think of anything good, I’ll holler at you! Not holler-holler, no yelling. I will kindly let you know if I think of anything! Haha this is a good post! It would be cool to have a catchphrase as memorable as these ones are. This is the first time I’ve visited your blog so I don’t think I can tell you what your catchphrase should be and how much you should use it, but I can tell you to have spaghetti for dinner on Tuesday! It’s good! And it’s fun to play with. Maybe the noodles will help jog your memory of all the different things you’ve said in your life that could be your catchphrase. Thanks, Brittany! Spaghetti sounds great…I just might give that a go! Hmmm. I dig this challenge, mostly because you’re asking us to commit a selfless act. I keep thinking of fun ones, but I want to use them myself. So here are my sloppy seconds. I like them all…but I’m especially fond of “It’s late here in Reno.” How bizarrely original would that be, considering that in all likelihood I would be uttering that phrase someplace other than in Reno? That’s just confusing enough to work! What’s That Weird Buzzing Sound?